Dubai, UAE, December 5, 2017: Skyline University College held its 5th Edition of Skyline Carnival on December 1, 2017 at Skyline Campus in University City of Sharjah. SUC Founder President Mr. Kamal Puri welcomed the Chief Guest of the event, Mr. Mohammed Diab Al Musa, Education Advisor of H.H. Sheikh Dr. Sultan Bin Mohammed Al Qassimi, Member of the UAE Supreme Council and Ruler of Sharjah for the event inauguration and UAE 46th National Day celebration. 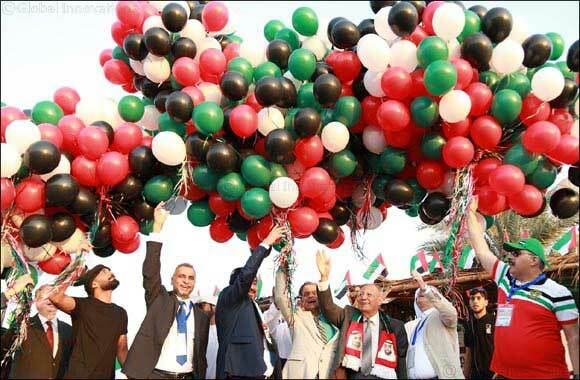 Balloons in colors red, green, white, and black were released as a symbol of support to the country and to the leaders of the UAE. Mr. Mohammed along with Mr. Puri and other VIPs visited the country stalls in the Skyline Carnival and joined in the fun as they rounded each stall with unique offerings. As the night took off, the crowd witnessed breathtaking performances of various universities in competitions such as Eastern Dance, Western Dance, Duet Singing, and Fashion Show. After the competition, the most anticipated part of the event, a live concert by Pakistan’s Coke Studio Sensation, Umair Jaswal and a performance by a budding UAE artist, Mustafa Khan took place. The winners of the competition were announced thereafter. Skyline Carnival is a youth-oriented talent festival showcasing various entertainment competitions, which are participated in by various universities in the UAE. Skyline Carnival also aims to bring together in one place the rich cultures and traditions of different countries.